Published August 7, 2016 at 1440 × 2560 in Student Spotlights. I moved to the Bay Area after being in Phoenix, AZ for 16 years. I was stressed out, unmotivated, and out of shape after living in Las Vegas for two months for job training. 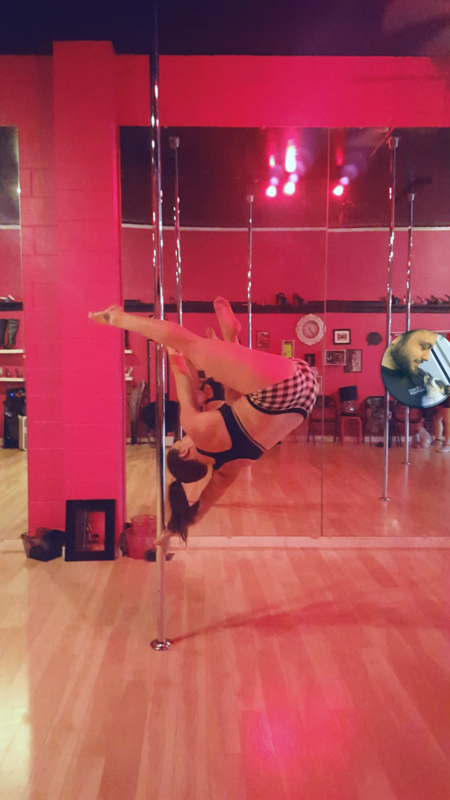 I always wanted to try pole fitness and Spin Sity was 5 minutes from my house… 6 months later I have lost 10 pounds, nailed tricks I never would’ve dreamed of doing, and most of all regained my purpose in fitness. A huge thank you to my coach Angel and thanks to Jennifer for making it happen! 1. I am a restaurant manager for a busy steak and seafood place on Pier 39 in San Francisco. 2. I own 3 happy little Chihuahuas. 3. I have been running and lifting since I was 16 and coached gymnastics for several years. 4. I have 3 tattoos and the itch for more! 5. I ran a full marathon back in 2012!